GLENDALE and VENICE, Calif.—Sixty-nine years separate the first production of Lillian Hellman’s classic The Little Foxes on Broadway in 1939 and the first production of Joe Gilford’s Finks at Vassar College in 2008. It’s now 79 years between Foxes and Finks in its West Coast premiere, produced by John Perrin Flynn at Rogue Machine, now located in Los Angeles’s seaside community of Venice. 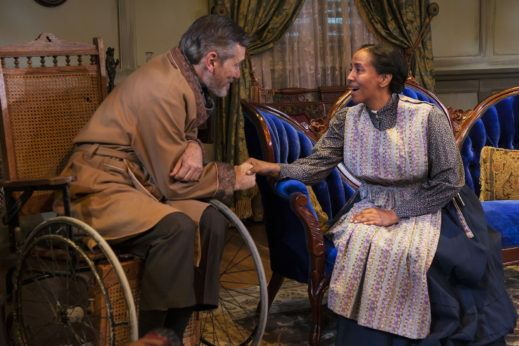 The Little Foxes is receiving what its producers call its first staging in L.A. in fifteen years at the Antaeus Theatre Company in Glendale. Yet there is a clear through-line in considering these two works: The blacklist. And why was there a blacklist? It was instituted to stifle the voicing of aspirations that America could become the great nation its potential—and its Constitution—promised for everyone. The Hollywood blacklist is fairly well known by now, though I hope that is not an overly optimistic assumption. Do high school and college students know about it? Do they know that people went to jail in the late 1940s for refusing to name names in Sen. Joe McCarthy’s witch hunt against known, presumed or former Communists and their allies? The Hollywood Ten are democratic heroes who sacrificed themselves and their careers for the sake of their personal dignity and for the cause of First Amendment freedom for every American. The recent movie Trumbo made a powerful impact in its telling of what happened to the highly regarded and commercially successful screenwriter Dalton Trumbo. From the start, the witch hunters used “Communism in Hollywood” as bait to decimate labor unions. In those days, as today, the right wing recognized that the single most influential pro-democratic (small d) force in the United States was the multi-racial labor movement. If you could persuade broad swaths of American voters that these evil pro-Russian elite Hollywood Communists were infiltrating the very movies we watch and want our kids to see, and could send renowned actors, screenwriters and directors down the “perp walk” for all to witness, then you held in your hands the tools to destroy the unions they were part of and in some cases led. What gets mentioned far less commonly are the freethinkers and democrats in Hollywood whose names were never known to the general public—working people behind the scenes as scenographers, cameramen, editors, costume designers, musicians, all union members. A whole industry grew up to uncover and catalogue the names of people who signed petitions during the Spanish Civil War, who subscribed to the Daily Worker and other left publications, who attended rallies for progressive candidates, who contributed to organizations protecting the foreign-born or that sought to build on the good wartime relations with the Soviet Union and avoid nuclear holocaust. Self-appointed agents colluded with federal agencies, the entertainment industry and advertisers to bring to heel all such “suspect” Americans. In their East Coast forays, HUAC hearings led to more than 300 directors, actors, radio personalities, composers, and screenwriters facing boycotts by studios. And what were Lillian Hellman’s terrible crimes? In 1934 her play The Children’s Hour broached the taboo subject of lesbianism. In 1939 The Little Foxes lobbed a well aimed cannonball against the cheating, racist monopoly capitalists that President Roosevelt called the “economic royalists” who opposed democracy and the New Deal—some of them were fascists in all but name. She supported the Republican side in the Spanish Civil War, and wrote The North Star, a film promoting the Allied nations’ alliance with the Soviets during WWII. The Little Foxes on display now is very much a melodramatic Southern Gothic period piece. Director Cameron Watson has chosen not to update it in any way “to fit this year’s fashions.” This tawdry tale of fraternal infighting in the Alabama of 1900 speaks for itself: a nasty, brutal episode that explains the rapacious capital accumulation of former slaveholders, now business entrepreneurs who will “bring the machine to the cotton, not the cotton to the machine” as they build their industrial empire in the Jim Crow South. Hellman’s brilliant exposé of greed, corruption, racism and woman-hating, with some gratuitous shooting of animals for sport thrown in for good measure, still resounds to this day. It remains her most popular stage work. Anyone unfamiliar with it, or who might be seeking a worthy refresher on it, would be well advised to check out this fine production. I was particularly struck by the detailed stage set (John Iacovelli) of the Regina and Horace Giddens living room, all plush curtains, heavy fabrics, thick carpets, red, green and brown earth colors—except for the bright blue Victorian-era divan in the middle, which doesn’t match anything. I couldn’t help thinking it’s the designer’s way of establishing that this family represents the South’s nouveau riche, aping current styles but obviously lacking polish. No one is specifically credited in the program with responsibility for the music. The piano music played on stage by Birdie and Alexandra was well chosen (and apparently performed by the actors themselves), but the intro and outro music heard before and between the acts seemed inapt—European-sounding concert music of a genre that did not contribute to the portrayal of the Hubbard and Giddens families of 1900 in the Deep South. It’s easy to see how composer Marc Blitzstein saw this play and in his mind heard it infused with all kinds of American music for his opera Regina. The performance is true and on point. Especially effective are the scheming brothers Oscar (Rob Nagle) and Ben Hubbard (Mike McShane), Oscar and Birdie’s dopey, wastrel son Leo (Calvin Picou), and the dipsomaniac Birdie herself (Jocelyn Towne). The daughter Alexandra is sprightly (and spritely) played by Kristin Couture. Timothy Adam Venable plays the Chicago businessman William Marshall with debonair grace. Judy Louise Johnson makes an upstanding Black house servant Addie, and William L. Warren acts well the smaller role of manservant Cal. Although I cannot fault the commitment of Deborah Puette to her role as Regina Hubbard Giddens, I found the famous charmed seductiveness she employs to get her way in somewhat short supply. Regina is often cited as a feminist rebelling against her brothers’ machinations, but feminists, beware: She is an anti-heroine at best, only “leaning in” for herself, not for the cause of all women. Her sick husband Horace (John DeMita) has a properly warm, paternal mien about him, though he surely does not impress as a man weakened by a soon to be fatal heart condition. 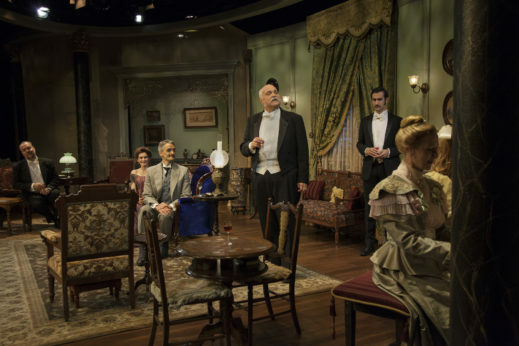 The Little Foxes plays through Dec. 10 on Fri., Sat. and Mon. at 8 pm, and on Sun. at 2 pm at the Kiki & David Gindler Performing Arts Center, 110 East Broadway, Glendale 91205. For tickets and further information call (818) 506-1983 or go to the company website. On the verge of TV stardom, comedian Mickey Dobbs (French Stewart) meets actress/activist Natalie Meltzer (Vanessa Claire Stewart) in and around New York’s famous leftish Café Society—“the right place for the wrong people.” Their post-WWII romance develops just as HUAC drops into town tasked with exposing Communist subversion in radio, television and the stage. Each of them has enough history of left-wing political activity to make them subject to the blacklist. 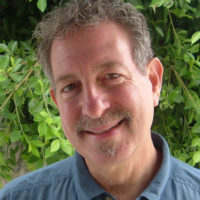 Finks was written by Joe Gilford, son of Jack Gilford and Madeline Lee Gilford, on whom Mickey and Natalie are based. It’s directed by Michael Pressman, son of director David Pressman and Sasha Pressman. Both writer and director are sons of blacklisted performers. The play opened on Nov. 10 and runs though Dec. 30. 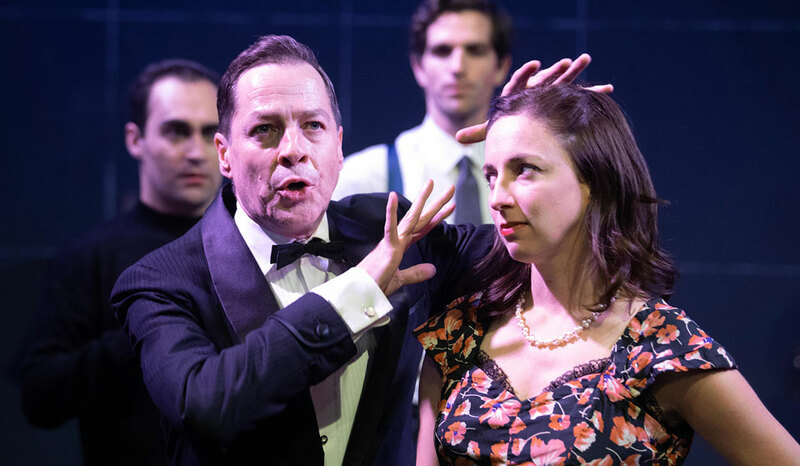 As it happens, French Stewart and Vanessa Claire Stewart are husband and wife—it must not have been hard to find someone to run lines with. After its Vassar debut in 2008, Finks was produced in 2013 in New York City and was nominated for a Drama Desk Award. Joe Gilford is now in development for Finks as a TV series, which, if it’s anything like the play, has the promise of being a real blockbuster. Aside from the central married couple, other characters in the play such as the real-life Martin Berkeley, Elia Kazan, Budd Schulberg, Lee J. Cobb are familiar names in American theatre—and all were “finks.” HUAC interrogator Rep. Francis Walter (Matt Gottlieb) also appears bullying the witnesses. Some of the actual HUAC testimony is included. Screenwriter Fred Lang (Bruce Nozick) and Bobby Gerard (Adam Lebowitz-Lockard) are, like the Dobbses, fictionalized, but they struck me as representative of Richard Collins (perhaps), who drank himself to death, and choreographer Jerome Robbins, who “sang” under threat that his homosexuality would be revealed. Gilford went on to appear in the musicals A Funny Thing Happened on the Way to the Forum and Cabaret, as well as the film Cocoon. Professional excellence and success were his ultimate victory. Although the word “finks” has no discernibly positive resonances, the portrayal of those who succumbed to ratting out their professional colleagues is neither consistent nor repetitive. Michael Berkeley (Thomas Fiscella, who also plays a number of other roles) seems to relish his time in the spotlight and his opportunity to recite a long list of left-wing people he knew. Other friendly witnesses are somewhat less enthusiastic: In the case of Bobby Gerard, one can sense the public humiliation he fears if his bedroom secret is disclosed. The anti-Communist witch hunt was also a dangerous time for homosexuals, who were likewise forced out of positions of responsibility and often jailed for “crimes” that do not exist today. The “unfriendly” witnesses before the Committee all take different approaches, each one a joy to behold in its own manner. As Mickey departs for his session, still unsure how he will respond to questioning, Natalie says, “Think about what we’re going to tell our son”—the son being, of course, the playwright himself. Also in the cast are Daniel Dorr and Stephen Tyler Howell, with Richard Levinson as Dickie Lewis (the Piano Man) accompanying at appropriate moments. A couple of songs (uncredited so far as I could see) from Harold Rome’s 1937 revue Pins and Needles are included. Gilford has captured the language of the period so well—the corny jokes with a political edge, the earnest urgings to get involved and take a stand, the folk music of the time (“Which Side Are You On?”), the radio commercials, the Abbott and Costello routines, the soap operas, the Yiddish words flung about in this largely Jewish community. One can hardly ignore the transparent anti-Semitism, or anti-“cosmopolitanism” to use a contemporary term, in the persecution of political heretics. Stephanie Kerley Schwartz supplies a utilitarian scenic design, Matt Richter the lighting design), Christopher Moscatiello the sound design, Nick Santiago the projections, Halei Parker the costume design, and Marwa Bernstein the choreography.